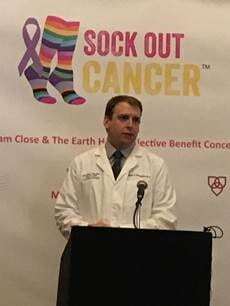 Organizers of the local “Sock Out Cancer” campaign gathered Monday, April 9, to announce details of an upcoming fundraising concert at the Palace Theater in Albany on Tuesday, May 8. Dr. Kyle Denniston from St. Peter’s Radiation Oncology, along with other local health care providers and dignitaries, was present to help kick off the campaign. The show’s headliner is William Close and the Earth Harp, and all proceeds from the show are being split between St. Peter’s Hospital Foundation and the Albany Medical Center Foundation. In addition to the concert, rainbow socks are currently being sold at Mercy Me Gift Shop at St. Peter’s Hospital. Each pair of socks is $10, with $5 of each sale going directly to St. Peter’s Hospital Foundation, earmarked for cancer care services. “Sock Out Cancer” is a nationwide effort to help families dealing with cancer pay for everyday expenses such as food, gas cards, and utilities. The goal is to offer assistance so they can put all of their energy into winning the battle against cancer. To purchase tickets for the show, visit the Palace Theater online at https://www.palacealbany.org/events.